Surprised? Yes, a national park is located in northeastern Ohio. What may be even more surprising is just how beautiful it is. Unlike vast wilderness parks, this national park is full of quiet and isolated trails, tree-covered hills, and serene marshes thriving with beavers and herons. It can be a relaxing getaway, yet offers numerous options for the active. The park continues to serve the metropolitan area in many ways. Residents often jog the trails, while bikers can be seen strolling through the park. Even in the winter, children can be seen zipping down hills on their sleds. Cuyahoga Valley feels like an escape from urban civilization and can be enjoyed by all ages. For nearly 12,000 years people have inhabited the Cuyahoga River area, leaving a legacy of archeological sites throughout the valley. The river was an important transportation route for Native Americans who named the river Cuyahoga - meaning "crooked river”. It was actually a neutral territory for all tribes traveling from the Great Lakes. By the 1600’s, European explorers and trappers had arrived. The first European settlement, the Moravian village of Pilgerruh, was located near the meeting of Tinkers Creek and the Cuyahoga River. In 1786, Connecticut reserved 3.5 million acres in northeastern Ohio for settlement by its citizens, also known as the Western Reserve. In 1796, Moses Cleaveland arrived to serve as a land agent for the Connecticut Land Company and helped create the city… you guessed it - Cleveland. In 1827, the Ohio & Erie Canal opened between Cleveland and Akron, replacing the river as primary commerce transportation in the Midwest. It was replaced by the railroad in the 1860’s. 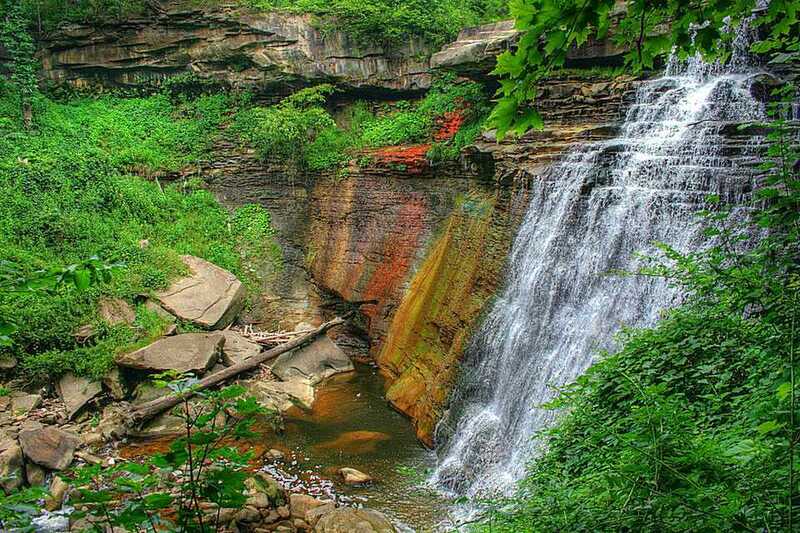 In December 1974, President Gerald Ford designated the area as Cuyahoga Valley National Recreation Area. It was later re-designated Cuyahoga Valley National Park on October 11, 2000. Cuyahoga Valley truly is a year-round park. Each season seems more beautiful than the previous and brings with it numerous activities for visitors. Weekends tend to be crowded from spring to the fall, which happen to be the most spectacular of the seasons. While the spring brings bright wildflowers, the fall boasts amazing foliage. And if you enjoy skiing, snowshoeing, and sledding, plan a visit during the winter months. Major airports are located in Cleveland and Akron. (Find Flights) From Cleveland, take I-77 ten miles south… and you’re there! From Akron, head five miles north on I-77 or Ohio 8. If you are driving from the east or west, note that I-80 and I-271 bisect the park and will be your easiest routes of travel. Nothing! Not only does the park not charge an entrance fee, there is no camping, hence no permits required. If there are special activities or concerts, the park will charge specific fees. There are no campgrounds within the park and backcountry camping is prohibited. However, state park and private campgrounds are located within the area. The closest state parks are West Branch State Park (330-296-3239) and Findley Lake State Park (440-647-4490), both located about 31 miles away. The closest private campgrounds are Silver Springs Park (330-689-2759) and Streetsboro/Cleveland SE KOA (330-650-2552), both located within 11 miles. Lodging is available within the park. The Inn at Brandywine Falls offers three rooms and three suites, all with a complimentary breakfast for guests. It is open year-round and prices range from $119-$298 per night. The Stanford Hostel is also open year-round. It was built in 1843 and is listed on the National Registrar of Historic Places. There are separate dorms for men and women for $16 per night plus a $3 bedding rental fee if needed. First Ladies National Historic Site: Two properties, the home of First Lady Ida Saxton McKinley and the seven-story 1895 City National Bank Building, are preserved at this site, honoring the lives and accomplishments of First Ladies throughout history. Hale Farm & Village: Located on Oak Hill Road in the southwestern part of the park, this living-history museum recreating life in a typical 19th-century community. Boston Mills/Brandywine Ski Resort: For skiers and snowboarders of all ages and levels of expertise. Each resort has at least one terrain park.